We’re fresh off a trip to Europe, but this was no vacation. In six days, we drove over 1,300 miles to 6 countries to test over 100 dogs. Of those dogs, we decided to take only a small handful into our protection dog training program. That’s a lower acceptance rate than Columbia and Harvard! 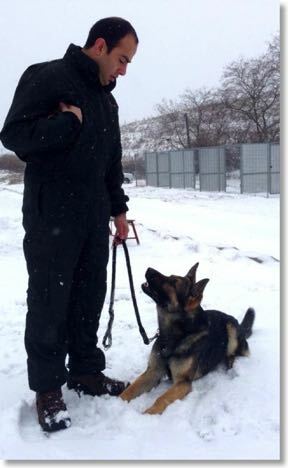 It’s not that there’s any shortage of nice German Shepherds or Belgian Malinois in Europe, it’s just that the best personal protection dogs need to be well-rounded in everything- health, temperament and protection. We don’t train police dogs or military dogs, so it’s not enough for a dog to bite a sleeve or turn on aggressively. They need to be friendly and obedient, and they need to accept even a five year old as their master. Finding a dog with one or two exceptional qualities is easy, but finding one with all of them takes legwork. We want to raise the best dogs for personal protection possible, so we’re highly selective about which dogs to bring back. At the same time, we realize that any dog we pick will be given months of our intensive training before going to a home. Great dogs aren’t born, they’re made, and we know how to make them great. To do this though, we need to start with a certain amount of raw talent. What are some of the things we’re looking for? We check for things like making sure they won’t back down from an aggressor, that they have tenacity, and that they are accepting of children and other dogs. Because our program is very physically demanding, we make sure that all of our dogs are healthy and in prime physical condition. In Europe, we also seek and select dogs that fit client requests. If you’re interested in a different dog than our current protection dogs for sale, we can keep you in mind for our next trip. Contact us today to let us know what your needs are.